Michelle Kulas worked in the health-care field for 10 years, serving as a certified nurses' assistant, dental assistant and dental insurance billing coordinator. Her areas of expertise include health and dental topics, parenting, nutrition, homeschooling and travel. Many people have experienced the pain of an earache. Whether it comes from the middle ear or the outer ear, an earache can be very painful, though most of the time it is not a medical emergency. If you feel the symptoms of an ear infection coming on, you may be able to reduce your pain with vinegar and other home remedies. If home remedies do not work, if your pain is severe or if it occurs in a very young child, contact a medical professional right away. Vinegar can act as a preventive and as soothing eardrops if you have swimmer's ear, which is an infection in the outer part of the ear canal. To prevent swimmer's ear, mix equal parts of white vinegar and rubbing alcohol, and place five to 10 drops of the solution in each ear after swimming or bathing. Allow the solution to sit for a few minutes, then tilt your head to let it drain out. If you have swimmer's ear, use only vinegar with no alcohol, as the alcohol will burn and sting the already-inflamed area. Most of the time, a middle-ear infection will clear up on its own within a few days. In the meantime, you can use home remedies to reduce your pain. Apply a warm compress to the ear or try warmed oil. Warm olive or vegetable oil to body temperature, then place a few drops in the affected ear. If you have a cold with congestion, a decongestant can help reduce the pressure associated with your ear infection. Over-the-counter pain relievers, such as acetaminophen or ibuprofen, can also help. If your ear infection lasts longer than three days or if your child under the age of 2 has an earache, contact a doctor promptly. Your doctor can prescribe pain-relieving eardrops to help you get through the time until the infection clears up. You also may need oral antibiotics to clear up the infection. If your child gets frequent ear infections, he may need a surgical procedure to insert tubes into his eardrums to allow his ears to drain. 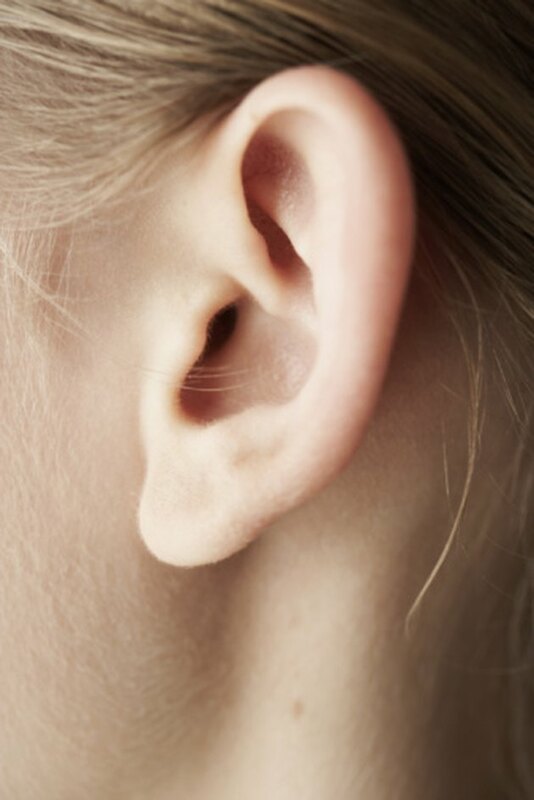 If you notice any drainage coming from your ear, do not place vinegar, oil or anything else in your ear canal. The drainage may indicate a ruptured eardrum, and any substance placed in the ear could cause further infection. If you use warmed oil, be sure that the oil is not too hot. If you have a fever or other symptoms besides your earache, see your doctor. What Can I Do to Ease My Swimmer's Ear Pain? Can Coconut Oil Heal Ear Infections? Can You Remove Ear Wax with Baby Oil?